(Nanowerk News) A new medical imaging method being developed at Rutgers University could help physicians detect cancer and other diseases earlier than before, speeding treatment and reducing the need for invasive, time-consuming biopsies. The potentially lifesaving technique uses nanotechnology to reveal small cancerous tumors and cardiovascular lesions deep inside the body. It is showing promise in early tests by Rutgers researchers in the schools of engineering and pharmacy. The Rutgers scientists, who published initial results of their work in the journal Nature Communications ("Rare-earth-doped biological composites as in vivo shortwave infrared reporters"), were recently awarded a $2.2 million grant from the National Institute of Biomedical Imaging and Bioengineering, part of the National Institutes of Health, to advance their research. Rare-earth nanoparticles encapsulated in albumin shells glow under infrared light. 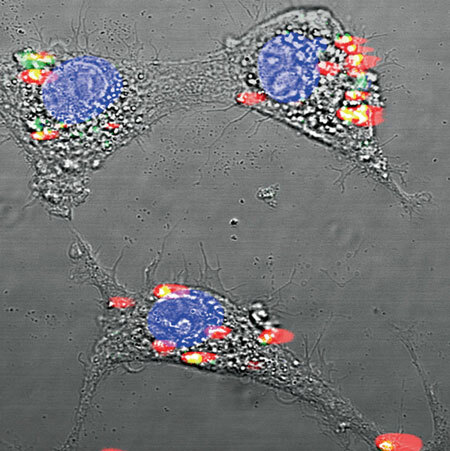 "Our new mode of fluorescent imaging aims not only to reveal diseases earlier, but also to learn more about the diseases before performing surgery," said Prabhas Moghe, the lead researcher on the project and distinguished professor of biomedical engineering and chemical and biochemical engineering. "I like to think of it as an optical biopsy." "This technique could eventually be used to accurately determine whether a newly detected cancer has spread to nearby lymph nodes, which should help a surgeon deal with the full extent of disease during a single surgery," said Shridar Ganesan, associate director for Translational Science at Rutgers Cancer Institute of New Jersey and clinical advisor for the project. Currently a surgeon who can't tell how far a cancer has spread may do lymph node biopsies and wait a day for results and then perform a second surgery if needed, with its attendant trauma, risks and costs. The Rutgers technology, co-developed by Richard Riman, distinguished professor of Materials Science and Engineering, uses a different type of infrared light than is used for imaging today. Called shortwave infrared, it penetrates skin and other tissue more deeply than visible light or the near-infrared light used in current imaging methods. This light stimulates dyes made with nanocrystals of rare earth elements – a family of 17 similar metals that are not scarce but are difficult to mine. Rare earths are in growing demand for electronic products such as smart phones, video screens and electric car motors and batteries. While scientists and physicians have long recognized the potential value of shortwave infrared light, fluorescent dyes that react to this light have either been too toxic to use safely or could not deliver sharp images. The dyes that Moghe and his team are developing encapsulate rare-earth nanocrystals in a shell of human serum albumin. They are well tolerated, distribute quickly through the body and accumulate at the disease sites. The researchers can employ different types rare-earth elements, which glow under slightly different colors of shortwave infrared light, to create a family of probes that are sensitive to a variety of cancers. "In this way, we can get a precise picture of the makeup and stage of the disease," he said. The researchers have demonstrated positive results in laboratory mice, and have shown that the spread of cancer even on a very small scale can be detected earlier than with traditional techniques such as magnetic resonance imaging or near-infrared imaging. This may open up new avenues for early intervention.